Natalie Woodhurst is a U.S. Air Force Veteran, former mental-health professional and ISSA Nationally Certified Fitness Trainer who began writing in 2010. Her enthusiasm for fitness and entertainment comes through when writing for various websites. Woodhurst is currently continuing her education in performance nutrition and fitness therapy. Vegetarianism encompasses a variety of diets, all of which spotlight plant-based foods. Some leave out meat but include dairy products and eggs. Vegans consume only fruits, vegetables, nuts, seeds, peas and beans, whereas semi-vegetarians allow themselves chicken, dairy products, eggs and fish but exclude all red meat. A plant-based diet has a number of known health benefits. A plant-based diet supplies larger quantities of certain antioxidants, vitamins, minerals and phytonutrients, as are some of the essential fatty acids. Focusing on the plant kingdom for food naturally aids vegetarians in cutting a lot of sugar out of their diet. Saturated fat, cholesterol and overall fat intake are typically lower as well. 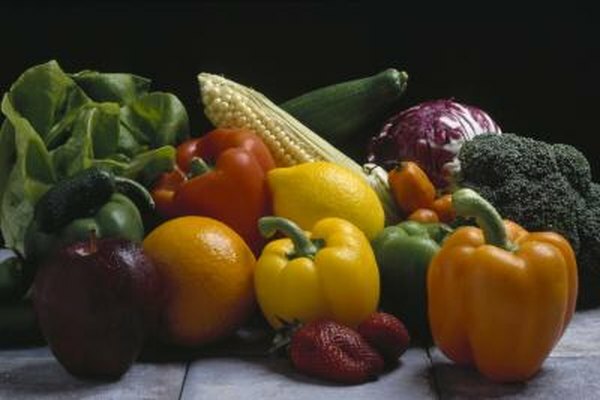 Eating enough fruits and vegetables is imperative for good nutrition, and this type of diet does contribute to healthier choices. Vegetarian diets have a downside to them. The body requires some nutrients that are deficient when limiting your animal product consumption. Plant-based foods are lacking in protein along with some vitamins and minerals. Proteins provides energy, helps burn fat and build strength, so not taking enough in may lead to adverse effects on your health. Getting adequate amounts of protein is possible while following a vegetarian diet. Variety is key when choosing protein sources because too much of a single type can lead to health problems. Soy is a vegetarian choice. You should also ensure that you consume proper amounts of iodine to avoid the risk of thyroid function compromise. Iodine is an element of the thyroid hormones, which soy can counteract. MayoClinic.com states that “foods such as soybeans, cruciferous vegetables and sweet potatoes may promote goiter.” A goiter is an enlarged thyroid gland. Vitamins B12 and D are essential for health. Vitamin D is the only vitamin available from the sun. The skin normally absorbs enough vitamin D just by getting outside every day. Supplements are also available and “Nutrition: The Complete Guide” recommends that vegetarians “aim for 1,000 IU on days you do not get any sun.” Vitamin B12 is available only from animal products, so supplements must stand in for this missing micronutrient. Vegetarians often get more calcium with their plant-based diet, but at times, the large amounts of fiber that accompany their way of eating may hinder absorption. Fiber has this effect because it speeds food through the intestines so the body does not have time to absorb all the calcium. Excellent sources of calcium are green leafy vegetables, broccoli, soybeans, nuts and seeds. Iron deficiencies are more of a hazard for vegetarians because meat is the easiest way to get iron. Spinach, beans, dried fruits and iron-enriched items will provide you with necessary amounts. Proper development and growth require zinc, which can be harder to get through a plant-based diet. Supplements can help and whole-grains, legumes, nuts and shellfish work.